Welcome to the `Predict the Goose‘ forecasting competition taking place as part of ECON 547 Time Series Econometrics at UVic. Congratulations to UVic economics students Bryce Edwards & Mathieu Weary as well as Dr. Martin Farnham on winning the first `Predict the Goose’ competition! The competition invited students and faculty to forecast the number of daily cyclists on the Victoria Galloping Goose trail more than two weeks into the future and was organised as part of the UVic’s graduate time series econometrics course taught by Dr Felix Pretis. 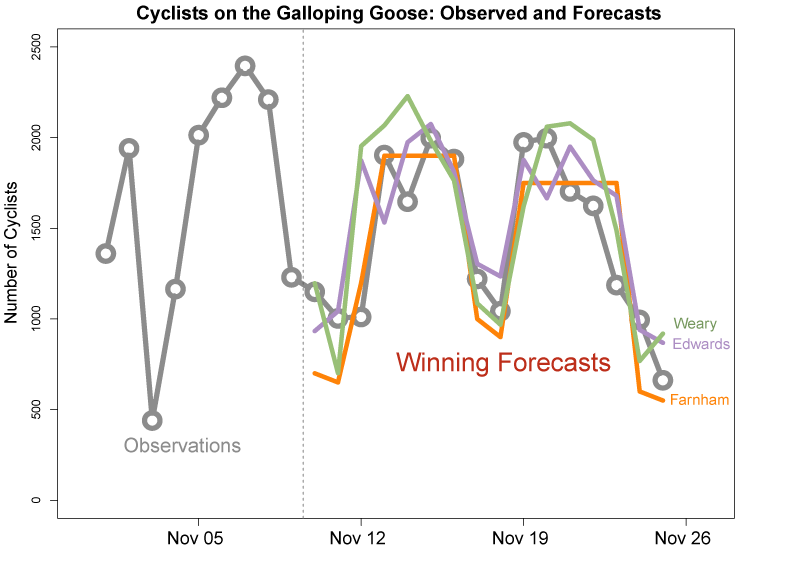 The winning entries used methods based on historical averages combined with expert judgment, exponential smoothing, as well as dynamic models taking weather forecasts into account. The winning entries accurately predicted the thousands of cyclists using the trail each day, with an average forecast error of only 15%. 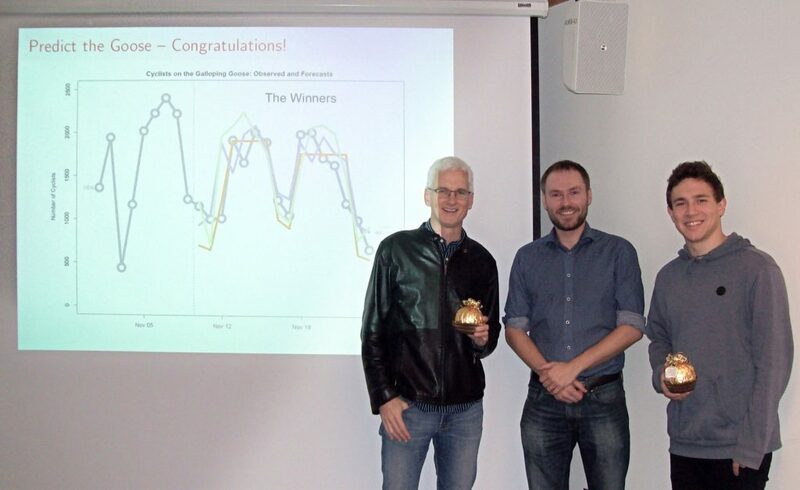 UVic Economics student Mathieu Weary (right) and faculty Dr. Martin Farnham (left) winning the ‘Predict the Goose’ Forecasting competition organised by Dr. Felix Pretis (middle). The undergraduate prize (and second overall) was won by UVic economics student Bryce Edwards. Cyclists on the Galloping Goose shown with the three most accurate forecasts. Predict the daily number of cyclists passing by the Galloping Goose Counter. Anyone is encouraged to enter the competition and submit a forecast! Using the data provided here (download), create forecasts of daily cyclists counts. The data ends on Oct 27th, 2018. The period to be forecast (and which will be scored) is: 16 days from Nov 10th to Nov 25th 2018 (inclusive). The csv file should be emailed to: fpretis@uvic.ca by November 9th, 4pm to be entered into the competition. Any form of prediction is allowed (empirical modelling using outside information, guessing, or even crystal balls). Just don’t go cycling by the counter to manipulate the numbers! Forecasts will be scored using the root mean square error of the submitted point forecasts (density forecasts may be considered in future iterations of the competition). Results will be made available and prizes will be awarded end of November.